This is a very cool conference with both sessions in Swedish and English. I’ll be presenting two breakout sessions. 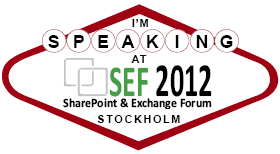 This session will talk about common misconceptions on developing custom solutions for SharePoint. The session will provide best practices about both “old” and “new” SharePoint 2013 development features, point out gotchas and dive into some IT Pro stuff a developer has to know about in order to be able to build solid SharePoint solutions. Many of the features provided by the Managed Metadata Service Application (MMS) are extremely popular in Document and Records Management scenarios for the enterprise. Improvements to MMS in SharePoint 2013 further enable additional scenarios. As such MMS will be a common candidate for use in custom solutions. This session will dive deep into the development of custom solutions which leverage Managed Metadata features. Creating and updating Managed Metadata fields both declaratively and programmatically will be covered, along with the eccentricities and best practices of the TaxonomyHiddenList and the different options for using Managed Metadata fields on custom web parts and pages. The “real” SharePoint Conference. This one is organised by Microsoft and it’s the biggest SharePoint Conference around. I will be presenting a single session here. Web Templates provide a compelling deployment model for your custom SharePoint solutions both to an on-premise deployment and to Office 365. Learn about the key capabilities offered by Web templates and follow various samples which will demonstrate different deployment scenarios, along with best practices and common pitfalls of developing Web Templates. The week after the SharePoint Conference in Las Vegas we’ll be in Amsterdam for SharePoint Connections. This is a very nice event where I’ll both be representing DIWUG, staffing the Ask the Experts area and presenting two sessions. The night before the conference, on Monday November 19th we will have a DIWUG event in the conference center. The event on the evening before the conference last year was a huge success with Dan Holme and Matthew Hughes speaking there. Keep an eye on the DIWUG site for announcements about this year’s event. Managed metadata is a key part of any document or records management solution in SharePoint. Especially in a large scale environment it will help users to use consist terminology to categorize their documents and to later on be able to find those documents again. Coming up with the appropriate metadata and the right amount of metadata in a large organization is a common challenge and requires a solid process in which all stakeholders are involved to determine the metadata. Ongoing management of the metadata throughout the lifecycle can also be complex as you need to ensure that metadata in the system remains relevant, without causing problems for users with existing documents by deleting too much metadata. This session will cover common pitfalls and lessons learned from real world experiences of managed metadata in large organizations and the new capabilities in SharePoint 2013 to help with the ongoing management of metadata. If not then you should definitely keep an eye on the MSDN and TechNet sites for SharePoint. A lot of SharePoint 2013 information has already been published there and a lot more is coming!